What an incredible day spent with well over 250 Gogo’s and Mkhulus in Ntshongweni at our 3rd official Mahala Market today! Joined by an amazing group of volunteers from the community as well as team from Green Office who did a Mandela Day collection in office and collection so many boxes of clothing for this project; and CHEP, who generously sponsored the marquee hire, entertainment and catering for the Gogo’s and Mkhulus today, each and every single Gogo and Mkhulu left with the HUGEST smiles. Their morning started quite festively – music and dancing – with a hot cup of tea and snacks and LIVE entertainment by the wonderful duo Qadasi & Maqhinga and then each got an opportunity to ‘shop for free’ – leaving with arms laiden with HUGE bags filled with clothes, linen, shoes, accessories all donated by our incredibly generous community! To top off their morning, they also got a bag filled with food to take home as well as a 1kg polony roll generously donated by Regal Meats. Our most humble thanks to Runga Trans for again donating one of your big 8 tonners to cart all the cargo, CHEP for sponsoring the catering and equipment; the boys and staff at DPHS for the thousands of pairs of shoes that were distributed in today’s project; the PHENOMENAL team of volunteers that joined us today to help with all the preparation and ensure personal attention for all our guests and not forgetting YOU – all the beautiful community hearts that have been clearing out your cupboards and donating your preloved goods for these elderly folk! 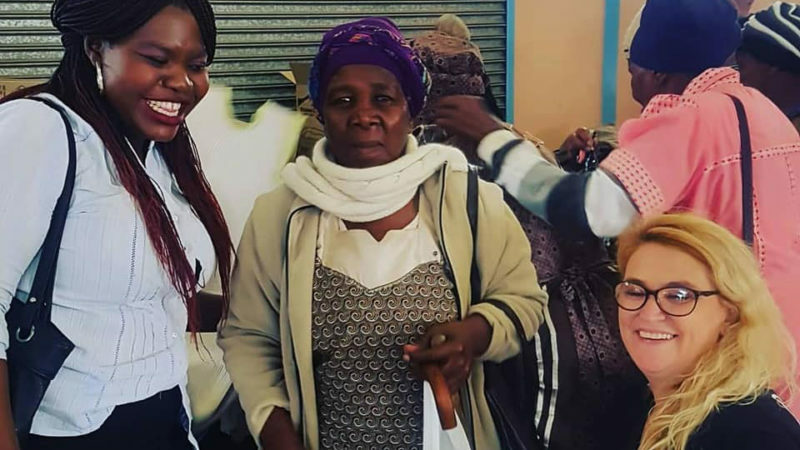 These elderly folk get by on so little with their state pensions and in 9 out of 10 cases, they also have grandchildren in their care due to the rising stats of orphaned and vulnerable child cases with HIV AIDS.